"The shred of consciousness tightened about his brain again and squeezed it once or twice. How weak our hold is on time, a voice seemed to be saying; and truly he had no idea whether hours, days or years had passed over him since… But now space moved in about him, black and cramping. Space was rectangular, he discovered, with narrow chinks of brightness, the very shape of a tomb. Above his face as he lay on his back a slab of blackness pressed down. In his utter deflation of mind and body he rested content to be a corpse, until suddenly consciousness coiled round him again and gave a venomous squeeze -for if a tomb he was alive in it. 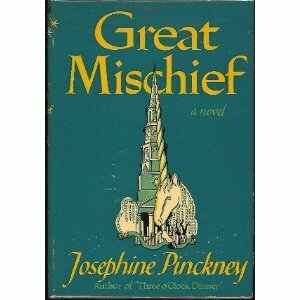 Great Mischief by Josephine Pinckney has to be one of the strangest books I have ever read. And I do mean ever. I found it serendipitously while hopping around Amazon looking for something in a spooky gothic read. How I landed on this one I'm not really sure, but I'm glad I did. I think. At the least, it hit the spooky gothic spot. And then some. I finished it weeks ago and it still makes my stomach do a little flip just thinking about it. Horrifying may not be the best word to describe it, but it's not easy to classify. It's unlike anything I've read before. At times it's revolting, unnatural, and a few parts made me feel borderline physically ill.
Great recommendation, eh? For 1948 this must have caused a lot of sensation. I'd never heard of the author, and from the number of reviews at Amazon (1) it's obvious hardly anyone else has, either. But that one review was so positive I decided to give her a try. I couldn't resist the idea I may have found a great, forgotten novelist. And did I? Well, maybe. Still thinking about it. The setting of the book is a small town "toward the end of the last century, a time already remote enough to make fables seem possible yet near enough our day to share its commonplaces." Pharmacist Timothy Partridge, his sister, and a Civil War veteran his sister cares for live above the shop. Seems like a pleasant enough arrangement with Timothy making the money and his sister running the household. But things are not always what they seem. Timothy is a restless man, self-educated with a library of quality books he's accumulated through the years. Among his many interests are witchcraft and the occult. In the evening, after closing up shop and having dinner with his odd family, he spends hours poring over his books. His interest has become a passion, and it's intimated that his yearning for supernatural experiences may have been the stimulus for what soon happens, after a mysterious woman he's never seen before comes in, out of the rain, asking for a mixture of herbs he knows can be toxic if not taken correctly. Timothy, suspicious and at first refusing, eventually gives in to her, after she employs a sort of seductive, persuasive side of her personality. Suddenly she goes from plain to sensual. Far be it from bachelor Timothy to resist. As time goes on the mystery woman reveals herself to be some sort of supernatural being. No surprise there; the build-up's pretty obvious. Exactly what she turns out to be, though, I would never have guessed. At this point I knew I had an unconventional book on my hands. I just didn't realize what was in store. From here things take a dive into darkness. Disaster hits, and Timothy's left looking for a home of his own. Soon he's visited by a witch who turns herself to smoke and sneaks through keyholes. He comes to dread nights; he never knows when she'll show up, and her presence is menacing. He discovers the name of the mystery woman from earlier in the book, and they begin a relationship. Because of Timothy's new situation, and newfound wealth, the townspeople begin to eye him strangely. He's no longer the former pharmacist, the kindly man they knew. Respect has turned to distrust as his reputation is ripped into tatters. How much more can I tell without revealing too much? Not a lot. Superstition, dark rites and a lot of destruction follow. Timothy, in many ways, realizes his wish to dabble in the occult. He also realizes nothing is given for free. For every wish granted, someone must pay. I'm frankly still surprised how dark this book becomes. What must readers have made of it? I found a modern review of it as a fantasy, but I'll warn you now it contains a couple spoilers. I also found a link with a photo of her as well as her gravesite. Intriguing how little seems to have been written about her. Then again, she's a "minor" author, one who didn't publish prolifically and apparently no to rave reviews. Verdict: Definitely an interesting experience, but it did give me the shivers. Horror fans would probably think it's nothing, but there's a lot to shock those of us who don't regularly read that genre. You can find very cheap used copies via Amazon, and perhaps through the library if they have extensive interlibrary loan and/or WorldCat. If you decide to read it I'd love to hear what you think.